16.02.2017 | Delmenhorst, Germany – If you would like to participate in the 21. 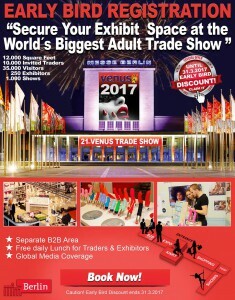 VENUS trade fair in Berlin from 12th to 15th October 2017 and would like to take a price advantage, you should hurry, our early booking campaign will run until 31st March 2017! The special feature: This year, there is a separate B2B area. In this way, the organizer makes it possible for exhibitors, who are exclusively interested in contact with trade visitors, to have a focused communication and an efficient target group interaction. Consumers are not allowed access to the B2B area during the following period: Thursday from 11am to 7pm, Friday from 11am to 7pm and Saturday from 11am to 3pm. More information and booking at www.venus-berlin.com.